The Science Museum of Virginia is celebrating March Ratness on April 3, 2014. The Museum's Rat Basketball Association will be representing the final four NCAA teams in this unique tournament. Ever wonder what rats do in their spare time? 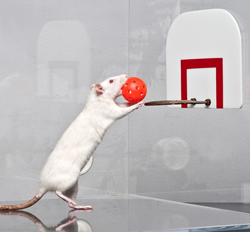 The Science Museum of Virginia has been concerned about rat recreation for many years – employing classical and operant conditioning techniques to enable our rodent friends the ability to enjoy the game of basketball. Since this is the time of year that college students enjoy competing to determine the very best homo sapiens undergraduate basketball players, we decided to again afford this opportunity for our rattus basketball players too! This isn’t an ordinary basketball tournament! The Museum’s RBA (Rat Basketball Association) will showcase the final four college teams – with Clara playing for University of Connecticut, Mae playing for University of Florida, Rita playing for University of Wisconsin and Sylvia playing for University of Kentucky. The big question is - will the rats predict the college tournament winner? Museum guests are invited to cheer on their favorite rats and teams as they go head to head in March Ratness! March Ratness is included with Museum admission. Tickets are $11 with $1 discounts for ages 4-12 and 60+. More information visit http://www.smv.org or call 804.864.1400.